Shipping is free of charge when you order 100 in our 5 gal buckets or 200 of our 2.20 liter containers. There is naturally a 10 day waiting time from payment to time of delivery. 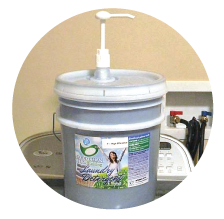 Our liquid laundry detergent is sold within a 20 gallon pail by using a pump and ships for free. We buy straight from a significant detergent manufacturer fabricated very High Quality detergents and fabric softeners. Our private label brand approximately a half of the price of typical name brand products. Have a very delivery party whenever your shipment arrives to dispense the buckets.